The Electronic Voting System for Parliaments was designed by Eurel and implemented on the basis of Parliamentary and Council requirements and regulations. The Electronic Voting System offers all the functionalities needed for performing activities related to law-making Assemblies. Through the equipments offered by the Voting System, the Assembly is able to take certified decisions with sure numeric results in very short times, as well as producing the documents necessary for reporting voting acts. Any Assembly provided with a Eurel Electronic Voting System can count on a safe, versatile, efficient and technologically advanced platform able to meet and comply with all the decisional regulations of an Assembly. The Electronic Voting System provides the support of Assembly voting activities guaranteeing that all results will be delivered punctually within execution times. The Electronic Voting System is only one of the components of an extensive Multimedia Platform for Eurel Parliamentary Assembly Halls. It incorporates other features -for example managing the daily agenda and other activities, managing the Public Address System and organizing Speakers, managing video recording (from the transcription of the Video Assembly onto Internet). 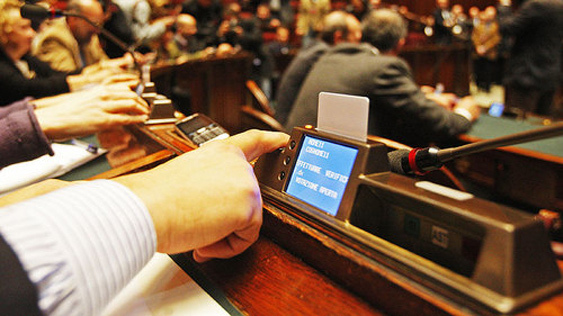 The Electronic Voting System offered by Eurel Informatica SpA is based on the know-how and development throughout 30 years of activity with projects, installations, updating and extensions of electronic voting systems for Parliaments and European Institutions, the Italian Parliament, Bodies and Institutions, Regions, Provinces and Municipalities. The Results Boards and Screens for displaying synoptically in real time the votes cast and the voting results. The system also has several devices to the production of the minutes of the occurrence and outcome of the vote. Each member of the Assembly has a Smart Card for identification purposes and in certain cases to certificate his/her identity via Finger Print. Eurel systems have been specifically designed to support main decisional Assembly activities. In particular, through the use of the electronic voting system it is possible to verify the number of those present (quorum) open voting, nominal open voting, secret ballots, roll call and any other eventual types of voting requested. Installing an Electronic Voting System can be adapted perfectly to the architecture of the Assembly Halls where it is to be housed thanks to the modularity of its components and the wiring needed to build the voting circuits. High personalization level of the types of votes to meet the requirements requested.